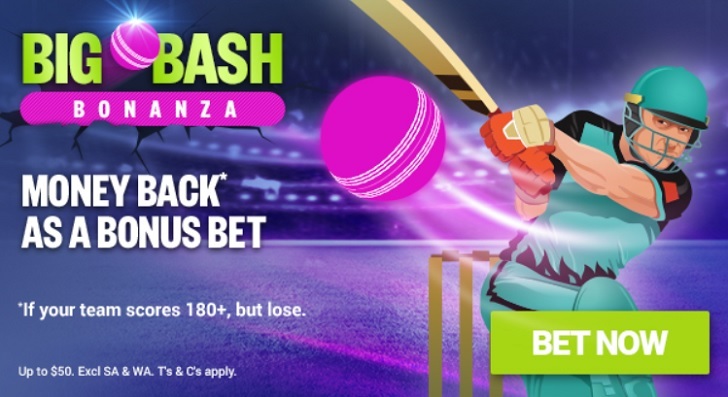 Round 8 of the 2018-19 Big Bash League Season will kick off on Sunday, the 13th of January with the final two games of the Sunday triple header and continue throughout the week. The round will be played in the midst of the Australia vs India three match ODI series, so some interesting secondary players will be seen as players on international duty sit out! We take a look at all four games in Round 8 of BBL08 and give our betting tips below. The Renegades will be back down in Geelong for their Sunday clash against the Heat and will be coming off two fantastic wins over the Hobart Hurricanes and Brisbane Heat in their last two games. The Renegades got skipper Aaron Finch back for just one game before he had to depart again for the ODI international duties, however, they did get back Marcus Harris from Test duty against the Heat in their last game. Harris, along with Sam Harper and Tom Cooper combined to easily chase down the Heat’s 144 to claim their fourth win and move to fourth on the table through seven games. The Heat will be hoping they can avoid losing to the Renegades in two consecutive games on Sunday when they travel to Geelong. New Zealand power hitter Brendon McCullum put up an admirable fight in the loss, posting 50 of 47 balls but ultimately couldn’t get enough help as the Heat’s batting failed once again. The Heat now sit 7th on the BBL table with just two wins from 7 games and will probably need something special to happen from here if they want to get back in the finals this season. The Renegades start as slight $1.80 favourites and despite a serious lack of star power on their roster at the moment, they seem to continue to get the job done. Their top order is still a bit of a concern but they have so much experience coming in the middle in Mohammad Nabi and Dan Christian that they are always a threat of chasing down big totals even if they get in trouble early. We think they continue to roll on Sunday in Geelong. The Perth Scorchers claimed their second win of the season on Wednesday night as they travelled to the MCG and downed the Melbourne Stars. After bowling first and being set 147 to win, both Cameron Bancroft and Ashton Turner were fantastic in the run chase, compiling 59 and 43 respectively to steer the Scorchers to victory. The Scorchers will welcome the return to the bouncy Perth Stadium wicket on Sunday, where they have had minimal success so far this year but where their bowling unit looks damaging, regardless. The Sixers had the bye in round 7, meaning we haven't seen them since their fantastic win over the Adelaide Strikers back on the 6th of January. Opener Joe Denly was the star of the night, compiling 76 off 60 balls to ease the Sixers to victory in just 18.2 overs. The Sixers have been the surprise packet of the season so far, winning four of their seven games to sit fourth on the BBL08 table. Perth will be without Jyhe Richardson and Jason Behrendorff as the two are on international duty, however, their fast bowling attack of Andrew Tye, Nathan Coulter-Nile and David Willey is still extremely damaging on the fast Perth wicket. We think their batting line-up also looks a lot more solid with the inclusion of Bancroft and they should be able to claim their third win of the season at home on Sunday. The Hobart Hurricanes lost their first game of the season back on the 7th of January as they travelled to Marvel Stadium to take on the Renegades. Their top-order was uncharateristically bad in the loss as both Matthew Wade and D’Arcy Short were dismissed early. George Bailey compiled a brilliant 70 off 53 balls while Ben McDermott compiled 50 off 43 balls to give the Hurricanes something to bowl at, but 145 proved to be not enough. The Hurricanes will face off against the other Melbourne team on Monday in the Stars, who have looked shocking since the departure of four of their key players for ODI duty. Glenn Maxwell, Marcus Stoinis, Adam Zampa and Peter Handscomb make up the core of the Stars team and without the quartet, they looked lost. The Stars could muster totals of just 146 and 137 in their two games against the Scorchers and Strikers since the departure of the international players and there looks to be no relief in sight. The MCG looked a pretty good batting wicket for the Scorchers when they faced the Stars on Wednesday night, so the Hurricanes should be able to take full advantage of an undermanned Stars bowling line-up here. The Sydney Sixers will be bitterly disappointed with their result in the final game of the triple header Sunday of BBL08. They traveleld to Perth to take on the Scorchers and after a brilliant team innings in which a;; seven all 7 players that batted surpassed 10 runs, the Sixers compiled 177 runs off their 20 overs. In reply, Cameron Bancroft knocked up his 2nd half century on the trot, belting 87 off 61 balls to steer the Scorchers to victory. The Renegades will be bitterly disappointed with their last game. Playing against the Heat for the second time in a row, the Renegades were bowled out for just 91 runs in an attempt to chase the Heat's massive total of 192. The Renegades top order failed once again with the bat as Harvey, Harris, Harper, Cooper and Webster all failed to pass 15 runs. The Sixers have been the surprise packet of the season so far and will start this game as underdogs against a Renegades side that looks a little lost at the moment. Without Aaron Finch to hold up their top order, the Renegades batting line-up looks extremely fragile, and we think the Sixers should win this one at home.